A week prior, we called San Diego Sailing Tours to see if they had an availability for our party of 10. They quickly responded and said that they could accommodate us on the Lei Lani! I booked the private party package, which included beverages (wine & San Diego craft beer) and snacks! Excited, I shot an email to my friends to let them know that during their time in San Diego, we have a private sailboat to take us around San Diego Bay. The date was set, Saturday at 4:30pm for a 3-hour sunset sail. We were excitedly welcomed in the parking lot with a smiling face. It was Jonathan, one of their crew members that will be helping us during our sunset sail! With his Kiwi accent, he gave us a quick run down of what's in store! We took care of the payments and signed a couple of safety documents and then we headed off to the Lei Lani. We arrived at the Lei Lani and out the boat comes Captain Jeff. He had the biggest smile and was really excited to welcome our friends. He gave us a quick walk-through of what we can take on the boat, the rules of San Diego Bay (being that it houses the largest naval complex in the whole world), what to do if someone goes overboard and where the best seat is on the Lei Lani (the bean bags out front). When I made reservations, we were told that on top of the beverages & snacks that they provided, we could also bring our own if we wanted. So to be safe, we brought a cooler of extra white wines and some beer, which we ended up not opening at all. We rock-paper-scissored for who gets to sit first out front to try out the bean bags! 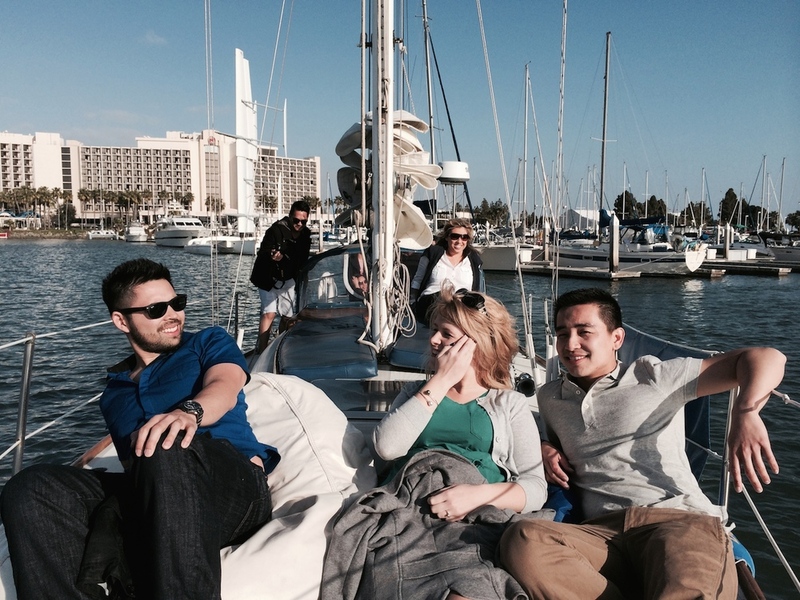 Some of us sat in the middle of the sailboat while some chose to hang with Captain Jeff at the stern. Jonathan then came up to the group to ask the big question, "Pinot Grigio? Sauvignon Blanc? or Chardonnay?" We said, "Yes! Yes to all 3." He poured us our glasses and off we sail into the sunset. The best part of this sailing tour is really seeing the expressions on our visitors' faces as we headed out into the middle of the bay. You can experience San Diego in different ways, like the nightlife, restaurants and the beaches, but to experience San Diego from the water is a totally different level. Watching the sun setting and the San Diego Skyline, while having a glass of chardonnay is a feeling better experienced than read about. We did what best friends do who've been separated for awhile. We sat around and talked about how awesome life was when we were younger and how much older we've gotten. A couple of our friends are engaged and one of them got engaged the week prior. It was the perfect setting for catching up and celebrating life. The sun slowly set and we all started to gather at the rear of the boat. We were sat around in a circle and all faces beaming with a content smile (or maybe, just buzzed!). With stomachs happily filled with cheese, wine and beer, we laughed the day into darkness. This is what a true San Diego Experience is all about: great company, great beer, great sunset, great weather, everything just great. With the sun gone, Jonathan handed us a couple of blankets as it started to get a little chilly. We had to document this epic time together so we handed him our phone to take a group shot before it was completely dark. What an epic experience out in San Diego bay. 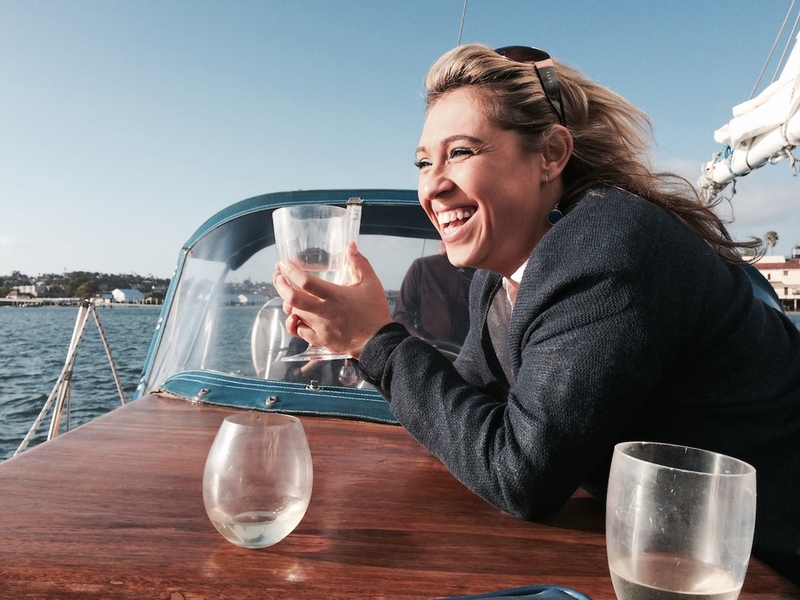 If you've never been on a sailboat, or visiting San Diego for a first time, you definitely should go on a sailing tour of San Diego bay. It was one of the most memorable experience for our friends visiting. 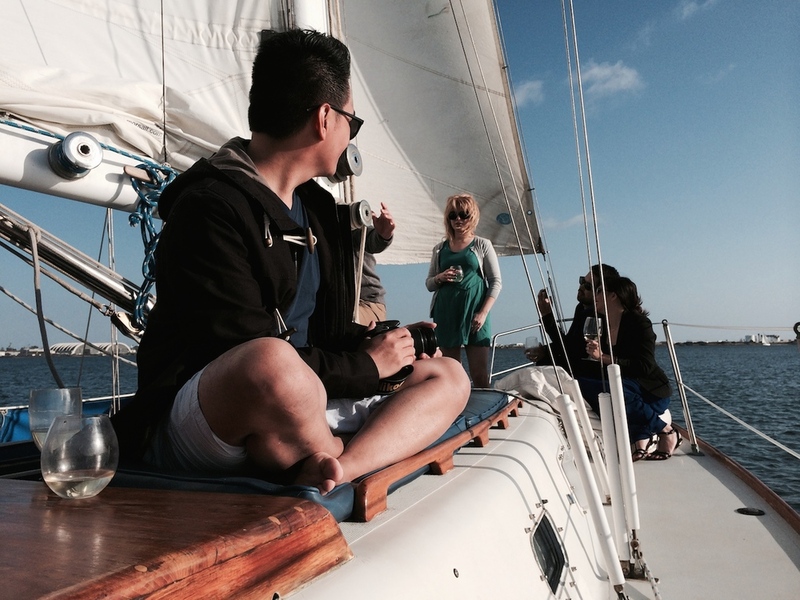 If you're looking for a San Diego sailing experience, we highly recommend San Diego Sailing Tours! Give them a call or email, they're quick to respond, and provide a really great experience for you and your friends.